Lied when Bush said there are Weapons of Mass Destruction in Iraq. The lie that keeps on killing. Bush's illegal Iraq war has killed over 1 Million Iraqi's, many civilian women and children. This is a war crime Bush and the rest of his cabinet should be tried for. We are hated throughout the world, and our national debt is skyrocketing. "We found the weapons of mass destruction." He was referring to trailers that he claimed were for manufacturing chemical weapons. These are the same trailers that Colin Powell showed cartoon pictures of at the U.N. The trailers were for equipment used to produce hydrogen for artillery weather balloons. Lied when they constantly imply that Saddam Hussein was involved in the 9/11 attack. A complete lie that Bush, Cheney, Rumsfeld and Rice sold to the American public. 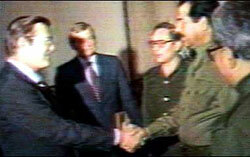 Lied when they said Saddam Hussein had direct links with Al Qaeda. Untrue, period. Lied about Iraq trying to obtain aluminum tubes to enriching uranium - they were for rockets. I read this story and with my own experience in manufacturing, even I could see it was a lie techinically. And the CIA didn't have experts smarter than me? B***s***. Lied when they said No Child Left Behind will help children and schools improve. No money was allocated to fund this program, all children are left behind. Lied when they said Social Security will be bankrupt by 2015. Bankrupt means no money, it will only be underfunded. Lied when Bush says he supports our troops. Bush has repeatedly signed or proposed legislation that cuts veterans benefits. He continues to send troops into battle without proper equipment. Lied when Bush said he supports equal rights for gays and lesbians, but not special rights. Bush opposes gays in the military, gay adoption, hate crime laws against gays, and gay marriage. He supports employment discrimination based on sexual orientation. These are all stands against equal rights, not special rights. Lied when Bush said he supports trigger locks: "There's a lot of talk about trigger locks being on guns sold in the future. I support that." He supported voluntary locks, not mandatory ones. Lied when they make the claim that Bush presses for Democracy around the world. Unless it is Saudi Arabia, Syria, China, or Venezuela where a military coup temporarily ousted Hugo Chavez, and Bush immediately supported the ouster (he opposed Chavez's oil policies). Lied when Bush said "... major combat operations in Iraq have ended." Lie. Lied when Bush said "The liberation of Iraq is a crucial advance in the campaign against terror," "We have removed an ally of al Qaeda and cut off a source of terrorist funding." There is no evidence of the Iraqi goverment funding al Qaeda. Osama Bin Laden hated Saddam Hussein because he was secular. Lied about the cost of the Medicare Prescription Drug program Threatened to fire a govt. employee who wanted to tell the truth: that the Bush administration was lying about the true cost, which was much higher.